Today we are releasing Windows 10 Insider Preview Build 10547 to Windows Insiders on the Fast ring. As usual, this build includes bug fixes and improvements over Build 10532 and also includes some new things for you to try and send us feedback on what you see. Improvements to Start: The default for tile groups on Start is to have 3 columns of medium sized tiles, but we heard feedback from many Insiders who wanted the ability to have a 4th column as well, so they could have two wide or large sized tiles side by side in a group. 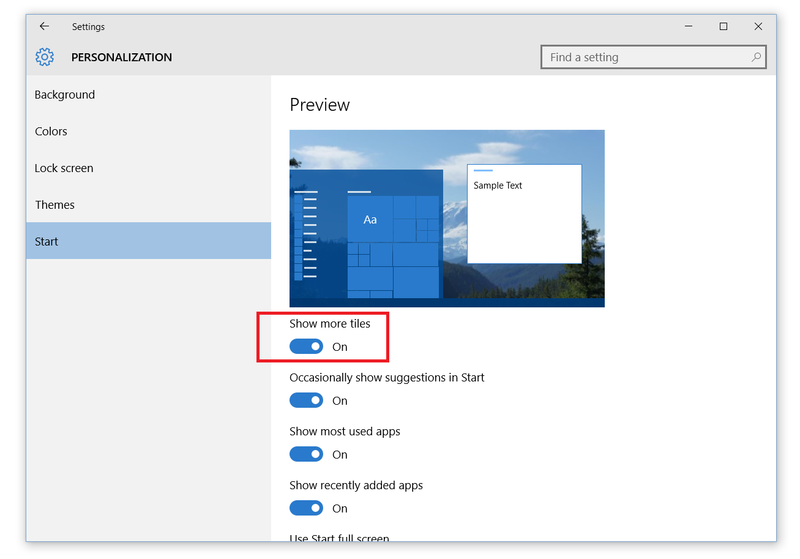 In this build, you can enable this by going to the Settings app > Personalization > Start and enabling “Show more tiles”. And for the Insiders that want more than 512 tiles on Start; we now support up to 2048. Give it a try and let us know what you think. Improvements to Tablet mode: When in Tablet mode, from Task View you can now snap apps to left and right, replace a previously snapped app with another (teeter) and swipe down to close an app. 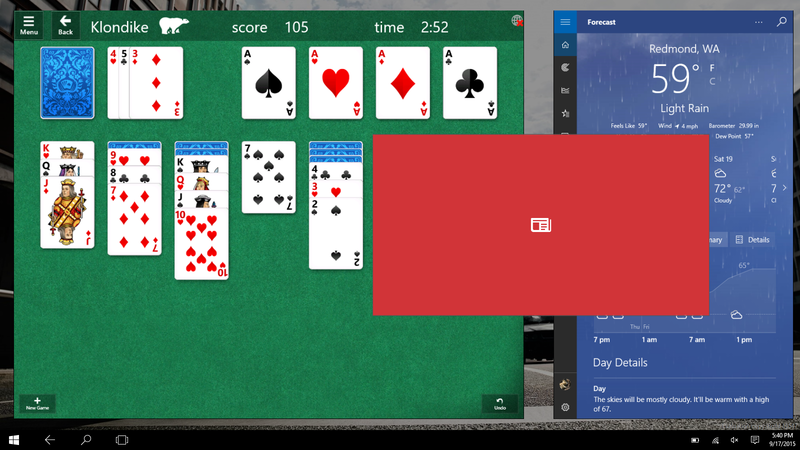 Many app updates: We’ve released many updates to our apps in Windows 10. For example – we’ve updated the Photos app to introduce a folder view that makes it easy for you to see your OneDrive and PC folders. The Xbox app has also received a pretty big update – you can read about it here from Xbox Wire. And many other apps such as Groove, Mail and Calendar and Maps have also received updates. Make sure to check the Store for updates, and send us feedback on these updated apps. Other improvements: You can now turn off the Windows background picture in the sign-in screen if you want by going to the Settings app > Personalization > Lock screen and turning off “Show Windows background picture on the sign-in screen”. Object RTC in Microsoft Edge: For developers, this build also includes a preview of Object RTC in Microsoft Edge. The ORTC APIs enable real-time audio and video communications directly inside Microsoft Edge without the need to install any plugins. You can learn more about how ORTC will work with Skype and Skype for Business over at the Skype blog, and developers can learn more about using these APIs at the Microsoft Edge Dev Blog. Text input panel improvements: The text input panel now expands as you write to provide more space in Latin languages. The text input panel also no longer opens automatically when you are not in tablet mode or have an external Surface keyboard attached. Additional punctuation support has been added to the suggestions bar to make entering punctuation characters easier. Lastly, improvements have been made to help the suggestions be more relevant. We have fixed a lot of the underlying causes of the critical error dialog Insiders were seeing with Start. And search should work more consistently now when interacting with Start. The notification icon for Action Center should no longer light up even though there weren’t any new notifications. We fixed an issue where the Battery fly-out text was truncated in certain languages. When choosing background shuffle, we’ve enabled the ability to shuffle backgrounds randomly instead of the order they appear in the folder. You can now use Cortana with local accounts as well as with a Microsoft account. You will be able to use Cortana without converting your local account to a connected MSA account. Due to a mix-up on our end – this functionality is not yet enabled this this build but coming with a new build in the coming weeks. We have fixed several issues with audio – including issues specific affecting Realtek audio devices. Windows Store apps may not update automatically. To receive app updates, open the Store, click on your profile picture at the top right, choose “Download and updates” and check for updates manually. Using Notepad.exe from the command line to open files when using only a file name, such as ‘file.txt’, will fail with a permissions error. This will be fixed in a future build, but this can be worked around by using a full or partial path, such as ‘.\file.txt’, or using File->Open options in the UI. Clicking on the system icons in the notification area quickly can result in Windows Shell blocking the launch of fly-outs like Audio, Networking, etc. This can be resolved by rebooting your PC. Languages packs are being published, but will be rolling out to the update servers throughout the day. 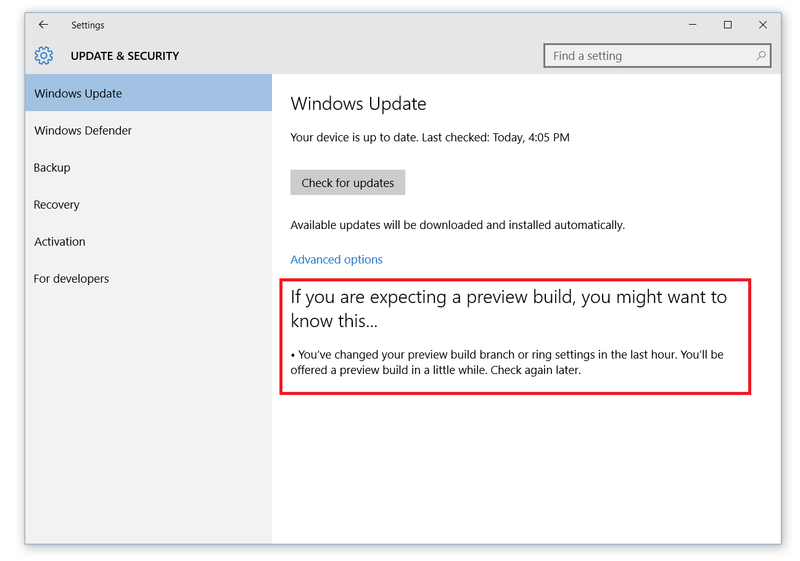 You will see a warning message in the Settings app > Update & Security > Windows Update regarding preview builds. Don’t worry about this - It is safe to ignore for now. We’re adding some new functionality to help you diagnose what’s going on if a new build isn’t getting to you, but it’s not fully implemented yet. For Windows Insiders who are gamers – we went live with the “Gaming on Insider Preview” topic in the Windows Insider forum. This new forum topic is the best place for Windows Insiders to get support for gaming-related issues with Windows 10 Insider Preview builds. It’s also a place for Windows Insiders to have discussions with other gamers too. In addition to our regular forum support staff, we’ll have engineers with gaming expertise on standby to assist in these forums, as well as some support staff from our partners, such as Intel, AMD, and NVIDIA, so feel free to stop by these new areas of the forum and let us know how you’re feeling about your gaming experience on Windows 10. For Xbox Live related features and games - you can also find communities to discuss those games at forums.xbox.com. As always, keep sending us feedback via the Windows Feedback app!